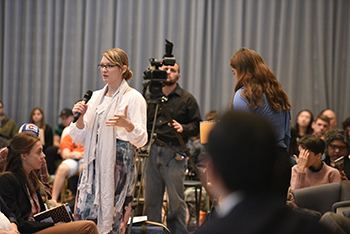 Students who attended “Running for Cover: Politics, Justice and Media in the Syrian Conflict” on Thursday, Oct. 6, said the event was an amazing opportunity and a great learning experience. They said it was helpful in broadening their knowledge about Syria and hearing from many distinguished speakers. The event, hosted by the Newhouse Center for Global Engagement, was a daylong seminar composed of several panels that analyzed the international community’s response to the Syrian conflict and its impact, as well as the challenges of reporting the war, developing political solutions and seeking justice for victims. “My biggest takeaway was to understand the limitations one may have in enacting change, but how one should not give up their quest for change despite the challenges,” said Tengan Peacock, a junior studying public relations and Middle Eastern studies. “It was really interesting to see how media is a tool in times of conflict and how we can use it as a tool to humanize those affected by the conflict and actively engage in change,” he added. He also mentioned SU student, founder of the group Reporters Without Borders Syracuse University chapter and panelist Elijah Shama as his inspiration for his passionate work in reporting and journalism. Most students at the seminar were seen sitting with a pen and paper, taking notes on the discussion and saving questions for the interactive sessions immediately following each panel discussion. Shraddha Rao, a graduate student studying arts journalism, said that she would refer back to her notes while researching her story on Syria for class. “There is so much to learn, people who have firsthand experience in Syria are here,” she said, speaking of photojournalist Reza and panelist Ammar Abdulhamid, president of Tharwa Foundation. “Several important issues surfaced during the discussions, from how can the perpetrators be held accountable for the war crimes, to understanding how controlled the media is in a situation like Syria,” she said while speaking of the importance of the event. While some, like Shraddha, were most impressed by the discussion on the situation in Syria, Morgan Bulman, a senior studying magazine and online journalism, said that his biggest takeaway was on new technology and virtual reality. “By the use of such kind of technology, we can visually experience what the people in Syria are suffering, and the impact and reach of media is greater. Perhaps then the conversation will not stop here, which is our role, as journalists, to ensure,” he said. “The most interesting part of Running for Cover, for me, was hearing about the same issue from the point of view of multiple disciplines,” said Phil Parker, who is pursuing graduate studies in history. There were meaningful debates that discussed the future of Syria and America’s role in the conflict. “This proves more and more people are talking about issues in Syria,” said Esteban Rodrigues, a sophomore studying international relations and anthropology. “What was most interesting to me was the changing role of the media and it being used as a tool for prosecuting in the international court,” he added.